You are here: Home / Animation Articles / Should I Use IK or FK? Really, these days this question is almost obsolete. 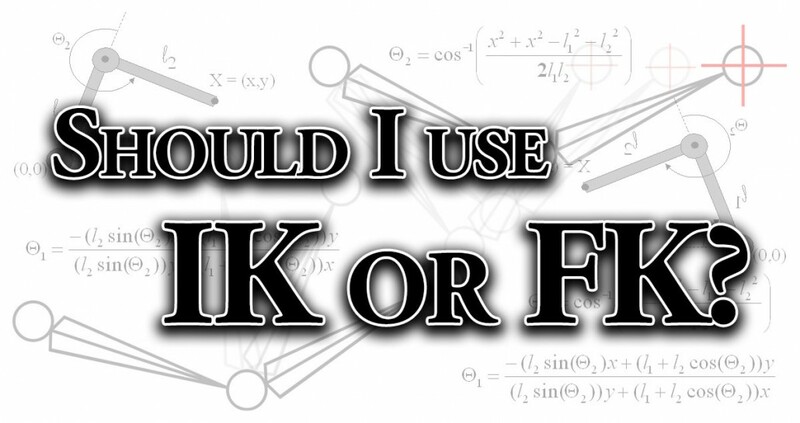 No matter what program you use for animation, it most likely has a switchable IK/FK solution. It’s important to understand what is happening to your characters joints at all times, though. The problem with IK is that it allows animators to become lazy. There, I said it. You see it all the time in reels and “newbie” animation. Heck, we all do it sometimes. When we let the computer worry about where the elbow (or knee, or spine, or tentacle joint) is, we can easily get lazy. This is the path to average character animation (at best).The important thing is arcs and force, not just in your end effector or hand, but also in the hinge joint, or elbow. Do both express an arc that shows the mood and attitude that you want for this particular movement? Your character is more than just their end effectors, and being a good character animator means maintaining control of every aspect of your scene. Is it the rigging of your character, or the ik of real creatures? Any movement where you fully extend a limb! I personally find IK is the best system for mimicking this type of motion on my characters. These days, I rarely use FK limbs in my animation, unless I am having real trouble with my arcs or poses. I find IK allows me to pose faster and thus try out more poses, ultimately leading to better animation. It also allows me to place the limb exactly where I want it. As long as I don’t get lazy and just let the animation software sort it out for me, I’m quite fine using pure IK limbs. So really, in your animation, whether you use IK or FK on your characters should be your choice. However, as animators, we often must work with the tools we are given. If you are asked to animate a character that ONLY have IK arms or only FK legs, you should do your best animation with whatever you are given. Why not practice animating both? Why not build a simple arm rig right now, and make two copies of it: one FK and one IK. Then practice animating both and getting the same results. Try animating many different types of motion, and see what it is you have to do to get the same animation our of BOTH rigs! It’s by doing little animation exercises like this that will really boost your skills as a character animator. So get out there and Start Animating! https://www.animationsalvation.com/wp-content/uploads/2014/11/Anim_IK-FK.jpg 634 1200 DJ Nicke https://zeitlosmedia.com/animationsalvation/wp-content/uploads/2014/11/AMS_Logo-Full-300x137.png DJ Nicke2014-11-17 09:14:002018-06-05 13:41:01Should I Use IK or FK? Just wondering. Would IK’s for arms be a bit harder to animate if using IK’s all the way? I’m thinking of bad arcs and joint popping will happen. I’ve animated for games and full IK’s rigs seem to hinder my animation, by experience. I do agree with most that you have said for IK’s. Though I hope people will try mixing the FK and IK systems in their animations. I agree with you, however most modern rigs allow you to switch between IK and FK, or allow you to change whether the IK arms follow the torso or not. With those tools, it makes sense to use the IK for posing, rather than having to rotate each joint to get the hand where you want it. But yea, each animator should experiment and find what works best for themselves.